Lorne Covington demonstrates how to manipulate media. 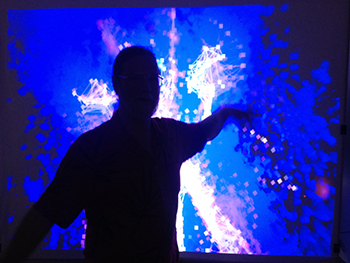 A fun, hands-on seminar sponsored by the Newhouse School will explore how gesture interfaces, wearable computing and remote media devices are converging to create a sea change in how we will send and receive information in the near future. The event, which will be held on Tuesday, Oct. 29, at 6 p.m. in the Joyce Hergenhan Auditorium in Newhouse 3, is free and open to the SU community. Newhouse faculty members Dan Pacheco, the Peter A. Horvitz Endowed Chair in Journalism Innovation, and William Ward, social media professor, will discuss the ways Newhouse students are using Google Glass to create first-person video stories and conceptualize social media apps. Lorne Covington, a response environment digital artist with Noirflux, will conduct demonstrations on how to manipulate media using the hands and entire body as the user interface. The event is part of the Newhouse School’s Digital Edge Seminar Series and sponsored by Journovation Central; Newhouse Professor Frank Biocca, director of the school’s M.I.N.D. Lab; and the Newhouse Global Leaders in Digital & Social Media Speaker Series. For more information, contact Pacheco at 315-443-9811 or drpacheco@syr.edu.